Parents meet every month for sessions about helping students succeed in all subject areas. Contact our Parent Coordinator, Chablis Paris for more information or go our KPLAY Facebook page for updates on Parent Coffee Hour sessions. 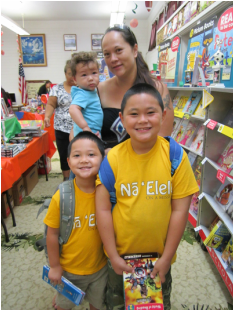 Twice a year, KWON hosts Scholastic Book Fairs which are open to students, parents, and staff. Join us to purchase books for kids! A percentage of the profits comes back to KWON to purchase books for the classrooms and library! Kim Oshiro, author of Simon the Skinny Pig, visited our Kindergarten-Grade 1 students in April. She read her book, sang a song for the students, and introduced Sammy the Skinny Pig! The students LOVED it! Come into the library to borrow her book or go to Amazon.com to purchase a copy.